At once charming and rugged, this heart-design entry set is the finishing touch for your Colonial or country-style home. 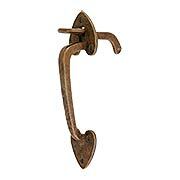 You get the look of a hand-wrought rim-latch with the security of a modern mortise lock. Constructed of heavy-duty forged iron, its surface is phosphate treated then lacquered, for rust-resistant, long-lasting wear. Early American-style bean tips and a smooth surface make this forged-iron rim latch a classic choice for Colonial or country style homes. Suited for passage, reverse bevel, and closet inswing or outswing doors, its surface is phosphate treated then lacquered, for rust-resistant, long-lasting wear. The set is designed for doors 1 3/4" in thickness (for thicker doors please call us for availability and pricing). 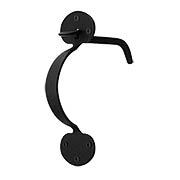 Comes complete with a privacy lock, all mounting hardware, and is reversible for right or left handing. Made in the USA. Classic heart tips and a smooth surface make this forged-iron rim latch a perfect choice for Colonial or country style homes. Suited for passage, reverse bevel, and closet inswing or outswing doors, its surface is phosphate treated then lacquered, for rust-resistant, long-lasting wear. The set is designed for doors 7/8" to 1 3/4" in thickness (for thicker doors please call us for availability and pricing). 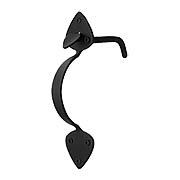 Comes complete with a privacy lock, all mounting hardware, and is reversible for right or left handing. Made in the USA. Early American-style bean tips and smooth surface make this forged-iron rim latch a classic choice for Colonial or country style homes. Suited for passage, reverse bevel, and closet inswing or outswing doors, its surface is phosphate treated then lacquered, for rust-resistant, long-lasting wear. The set is designed for doors 7/8" to 1 3/4" in thickness (for thicker doors please call us for availability and pricing). 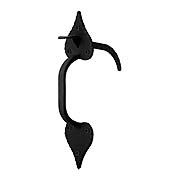 Comes complete with a privacy lock, all mounting hardware, and is reversible for right or left handing. Made in the USA. 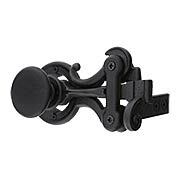 Charming heart tips and a rugged surface make this forged-iron rim latch a classic choice for Colonial or country style homes. Suited for passage, reverse bevel, and closet inswing or outswing doors, its surface is phosphate treated then lacquered, for rust-resistant, long-lasting wear. The set is designed for doors 7/8" to 1 3/4" in thickness (for thicker doors please call us for availability and pricing). 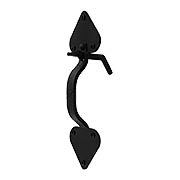 Comes complete with a privacy lock, all mounting hardware, and is reversible for right or left handing. Made in the USA. 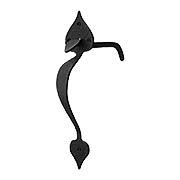 Early American-style bean tips and a rugged surface make this forged-iron rim latch a classic choice for Colonial or country style homes. Suited for passage, reverse bevel, and closet inswing or outswing doors, its surface is phosphate treated then lacquered, for rust-resistant, long-lasting wear. The set is designed for doors 7/8"- 1 3/4" in thickness (for thicker doors please call us for availability and pricing). 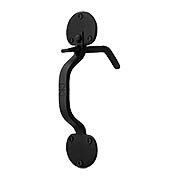 Comes complete with a privacy lock, all mounting hardware, and is reversible for right or left handing. Made in the USA. Charming heart tips and a rugged surface make this heavy duty, forged-iron rim latch a classic choice for Colonial or country style homes. Suited for passage, reverse bevel, and closet inswing or outswing doors, its surface is phosphate treated then lacquered, for rust-resistant, long-lasting wear. The set is designed for doors 7/8" to 1 3/4" in thickness (for thicker doors please call us for availability and pricing). 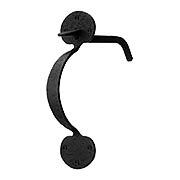 Comes complete with a privacy lock, all mounting hardware, and is reversible for right or left handing. Made in the USA. Our Knob Latch Set combines the classic style of a Suffolk thumb latch with a convenient knob. Made of cast iron, with a weather-resistant powdered coating, it is suited for period-authentic restoration or a splash of vintage style, inside or out. Comes complete with mounting hardware and installation instructions.